Visual Trumpery. Join the fight against fake data and visualizations! Alberto Cairo has embarked on an inspiring campaign to equip the citizenry with a solid visual literacy as an antidote where visual deceit runs rampant. His trumpery tour arrived in New York. I attended his fun and energizing talk. His call to action was: "join me in the fight!". Well, I am in! Do we need visual literacy? Well, according to the Pew Research Center only 63% of America adults can correctly interpret the most basic and time-old chart: a scatterplot. The number of 63% might sink to 47.25% if we took into account that arguably 25% of the correct "graphic literates" chose the right answer by sheer chance among the four possible answers. Presidential election results in Venezuela, based on a graphic by Venezonala de Televisión. Notice the truncated Y-axis which greatly distorts the difference between the percentages of vote. Breitbart published a story by reporter John Binder with this alarming headline “2,139 DACA Recipients Convicted or Accused of Crimes Against Americans". It's a staggering number indeed. Staggeringly low. If there are roughly 800,000 DACA recipients, 2,139 of them are just 0.27%, or roughly 3 out of 1,000. The numbers in the story suggest that undocumented youngsters protected by DACA commit proportionally far fewer crimes than American citizens do. Data deceit is a subject that I find very dear to my heart. At People Analytics: Don't be Fooled by Data! I ranted against the countless deceptions that often slip into what appears to be data-validated talk. Sometimes data that contains lies is used with good intentions, without malice. The data tricked someone in the beginning, and with an equal mix of goodwill and ignorance, you accept it as true and do not hesitate to share their false truth with the world. Other times, falsehood is intentional. These are deliberate attempts to deceive you and play you for a fool. Ordinary citizens (“muggles”), just like analysts (“wizards”), have to learn to defend themselves from both the malicious and the naive. You have to learn to check a few things before accepting any data that comes to you as statistics. Dictionary on the wall, what is Trumpery? I don’t like definitions, and I often distrust dictionaries and other reference materials. I have repeated it a number of times. I am sorry! Every time I read or hear the beginnings of articles, books, or lectures with phrases like ”Dictionary X (Wikipedia, Oxford, or whatever) defines the word… (’big data,’ ’analytics,’ ’measurement,’ ’marketing,’ or whatever) as blah blah blah”, it’s like re-opening an old wound. Because in the last century I was a dictionary writer. In his Dictionary of the English Language, Dr. Johnson gives us an insightful reference about the true nature of what used to be my job. Lexicographer: A writer of dictionaries; a harmless drudge that busies himself in tracing the original, and detailing the signification of words. This time, nevertheless, it is different. 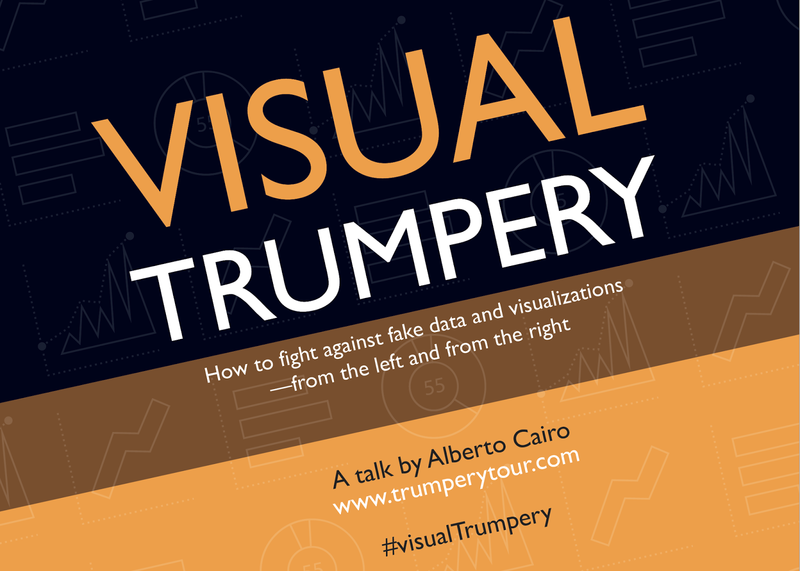 Understanding the pun behind "Visual Trumpery" leads us to that old books. On the other hand, it doesn't hurt to indulge oneself every now and again in flagrant contradictions. It is a salubrious vaccine against Hubris. 1. Is the graphic based on reliable sources and data? Any document or news story that uses data and graphics ought to clearly identify its sources and link to them. You, the reader, must be able to check whether they are trustworthy and whether writers and designers handled the data properly. 2. Does the graphic include enough information to be truthful? Visualizations should never simplify information. They ought to clarify it. You’ll soon understand the difference, thanks to the examples I’ll share with you. 3. Is the data correctly represented? Data visualization is based on visual encoding. Numbers are mapped onto spatial properties of objects, like their height, length, size, color, etc. When seeing a chart, graph, or map, always ask yourself: Are the properties representing the data proportional to the data itself? 4. Did the journalist or designer take uncertainty into account? Data is hardly ever precise or certain, regardless of what visualizations and news stories often suggest. A good understanding of uncertainty and elementary probability can help you decide what to think or how to act based on what you read. Weaponry to engage: Join the fight! The Second Amendment to the United States Constitution protects the right of the people to keep and bear them to defend us against the dark arts. Suffer in silence no more!